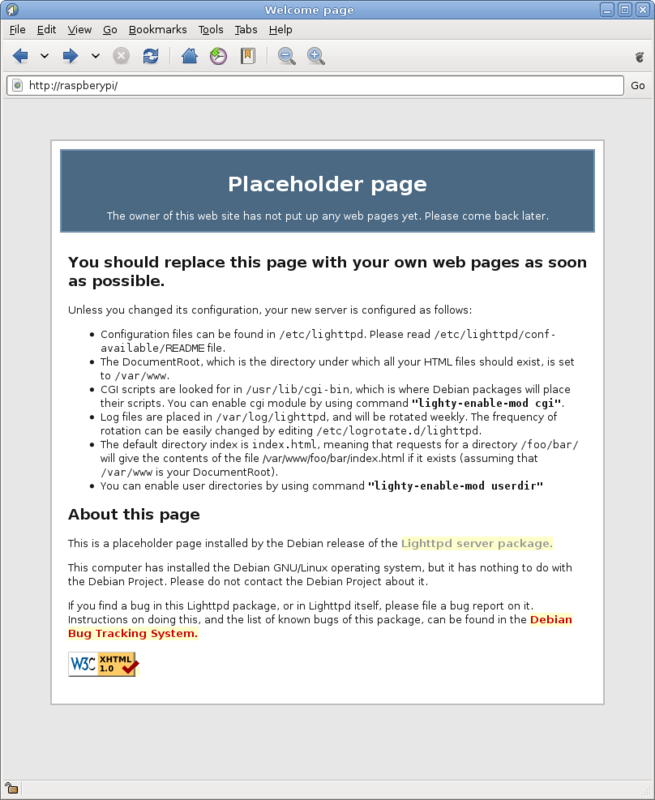 Lighttpd is a lightweight web server that is designed for use in high performance environments. However, because it has a relatively low memory footprint and has been optimized to make efficient use of the available resources, it also works well on a low power system such as the Raspberry Pi. 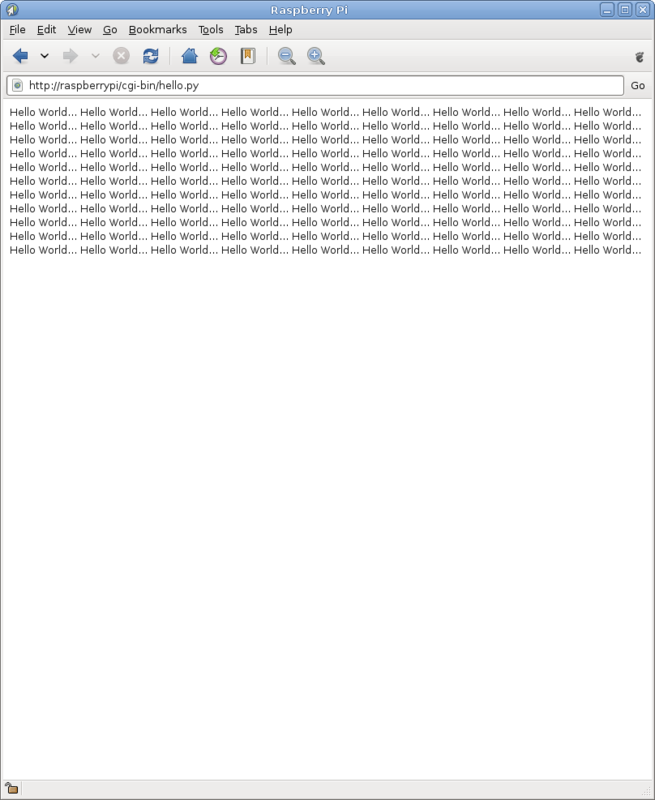 Normally server side scripts would use PHP but since python is the scripting language of choice on the Raspberry Pi, particularly when using the GPIO pins, I wanted to configure lighttpd to allow me to use python instead. Although these instructions were written for a Raspberry Pi using Raspbian they will work on other versions of Debian as well, providing the lighttpd package is included in the distribution. First you need to be running as root. Then start by installing python (which will probably already be installed) and lighttpd. Need to get 3799 kB of archives. After this operation, 15.1 MB of additional disk space will be used. After this operation, 1,170 kB of disk space will be used. Remember to configure the firewall to allow incoming connections to port 80. By default your web pages will be located in /var/www but I prefer to use a separate folder in the home partition instead. This allows me to backup any web pages and scripts with the rest of my user data on the home partition. You will need restart the web server for the changes to the configuration file to take effect. You should now be able to view the default home page on your server using a web browser. To be able to write CGI scripts we need get lighttpd to load the appropriate module by editing the configuration file and adding the extra line shown below. Then to get lighttpd to recognze python scripts we need to add the following new section at the end of the file. Since we specified that all python scripts should go in the cgi-bin folder above we need to create that folder and set the correct permissions. Finally we need restart the web server for the changes we made to the configuration file to take effect. To test it works create a small test script in the cgi-bin folder. Browsing to this page should result in the following output. This entry was posted in Debian, Linux, Raspbian, Ubuntu and tagged lighttpd, python, Raspberry Pi. Bookmark the permalink. Rather than print hello World 100 times is just prints the script. What did I do wrong? I suspect that the script either isn’t in the cgi-bin folder or isn’t execuitable (chmod +x). When I get some time I’ll see if I can reproduce the problem..